Art Journal was the longest running and possibly the most important art periodical of the Victorian period. It originated as the Art Union Monthly Journal in 1839 and renamed The Art Journal in 1849 following its acquisition by the publisher George Virtue (1794-1868). The editor of the journal for the first forty-years its history was Samuel Carter Hall (1800-1889). For much of that time he was also its proprietor. Hall was succeeded as editor by Marcus Bourne Huish (1843-1921), who ran the journal until 1892. Huish did much to widen the range of subject matter covered, allowing etchings and photographically-reproduced illustrations to displace steel engraving. Huish, in turn, was replaced by David Croal Thompson (1855-1930) who was editor from 1893 to 1902. Under Thompson, The Art Journal showed greater interest in the decorative arts fostered by the Arts and Crafts movement. 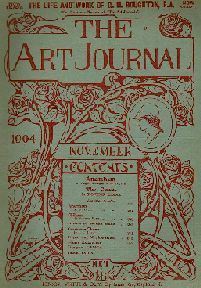 By the end of the nineteenth century, The Art Journal was facing fierce competition from numerous other art periodicals, notably The Magazine of Art (founded 1878), The Studio (founded 1893), The Connoisseur (founded 1901), and The Burlington Magazine (founded 1903). The Art Journal eventually ceased publication in 1912.